Volunteering her time, working at Country Mart, and taking a full-load of classes, sophomore Brianna Hand does a good job of balancing her busy schedule. 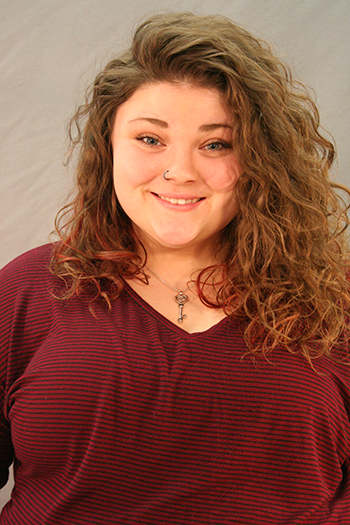 The art education major’s determination and drive has led to her being named the school’s February Student of the Month. Hand, daughter of Laura Fleming, has two sisters, Brailee 16, Hannah 10, and a brother, Michael 12. She graduated from Arkansas City High School in 2014. At ACHS, Hand was a member of the Art Club and newspaper staff. After meeting Cowley’s art instructors during the school’s Fine Arts Day events Hand decided Cowley was the school for her. At Cowley, Hand serves as the president of the Art Club. She has a 3.5 grade point average and is a member of the Honor Roll. Away from school, Hand teaches art classes to children at Winfield’s Arts and Humanities Center. She also baby sits and volunteers her time as she has accumulated more than 235 hours of community service during her time at Cowley. “Brianna shows it is possible to have a job, work hard at school, preside over a club, and do community service,” Cowley College graphics design instructor Mark Dykes said. In her free time Hand enjoys painting, drawing and doing ceramics. “It relaxes me,” Hand said. Hand said coming to Cowley has helped her grow as a person and become more independent. Still, being named Student of the Month came as a surprise to Hand. After volunteering to help assist with a third grade classroom at Frances Willard Elementary in Arkansas City, Hand realized she would like to one day teach art to elementary age children. She plans to realize that dream by graduating from Cowley College in May and then transfer to Emporia State University to pursue a Bachelor’s degree in art education.